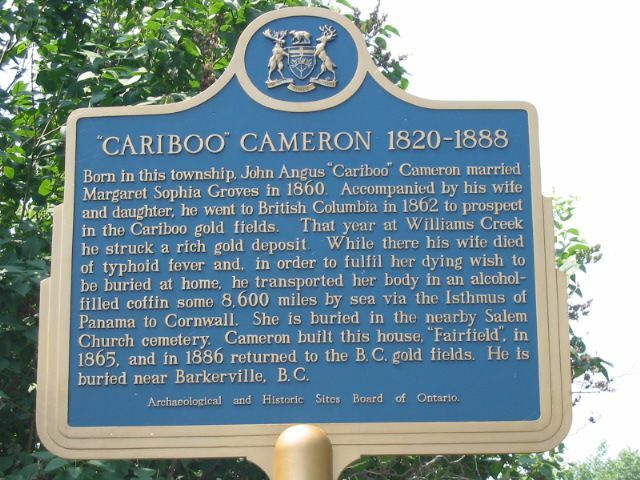 Born in this township, John Angus "Cariboo" Cameron married Margaret Sophia Groves in 1860. Accompanied by his wife and daughter, he went to British Columbia in 1862 to prospect in the Cariboo gold fields. That year at Williams Creek he struck a rich gold deposit. While there his wife died of typhoid fever and, in order to fulfil her dying wish to be buried at home, he transported her body in an alcohol-filled coffin some 13,840 km by sea via the Isthmus of Panama to Cornwall. She is buried in the nearby Salem Church cemetery. Cameron built this house, "Fairfield", in 1865, and in 1886 returned to the B.C. gold fields. He is buried near Barkerville, B.C. My grandmother, Helen Cameron Vipond Amell is a descendent of Cariboo Cameron and did research for the Cariboo Cameron plaque. I was only a child when we went to the unveiling with her to Summerstown. I live about 1 1/2 hours from there and am planning on visiting again someday. My name is Lisa Briley..(maiden name Guevremont). I spent 1 week every summer here since I was a young girl until I was 16 years old. 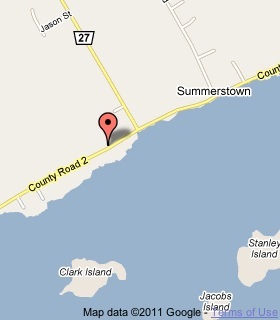 My uncle Phil Goudreau was a "brother" here as well as others who were "brothers". It was some kind of school for boys if I recall. Loved going here. Many wonderful memories were made here. Every year my grandparents, parents, aunts, uncles, and cousins would make the drive from Rhode Island to visit this beautiful home. Every year we would go to the cemetery to visit Margaret. I am glad to see these pictures after so many years. Every once in a while I would take out my photo album and look at the photos of the place we called home 1 week out of the year. I have an uncle who took many videos over the years that we visited..and looking forward to seeing them. Just today the Captain and the house crossed my mind. As weird as this sounds, I do believe he was trying to communicate with me for some reason. I know he was but was too scared. Thank you for this page and I would love to find out more information on the Captain. Just came across this page and wanted to make a couple of comments. I've been researching the Cariboo Cameron story for 28 years and have now given well over 1000 performances of my short play "The Spirit of Cariboo Cameron" at Barkerville Historic Town where he is buried. I have visited the Cameron Mansion twice and will be returning this fall to do some more research. Pierre Berton's account is loaded with inaccuracies, beginning with the name, John Alexander Cameron instead of Angus. Alexander (Sandy) was his younger brother. Berton later sent a letter of apology. Also, the daughter, Mary Isabella Alice, did die in Victoria at the age of 14 months and she is buried in the Salem Cemetery in Summerstown with Sophia. It is marked on the grave covering. His is a story like no other in Canadian history and I am honoured to be able to tell it. I studied in this school during the years of 2002 to 2004. I really liked the place because of its beauty and stories... 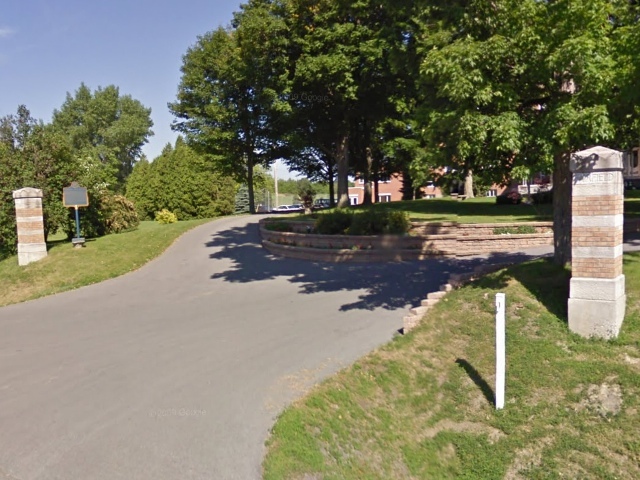 I remember that close by the school (about a mile) there is a church and a graveyard where, people say, Mr. Caribou's wife is buried. Very interesting place to visit! My name is Gene Sauvé and I lived at Fairfield for three years, from 1946 to 1949. 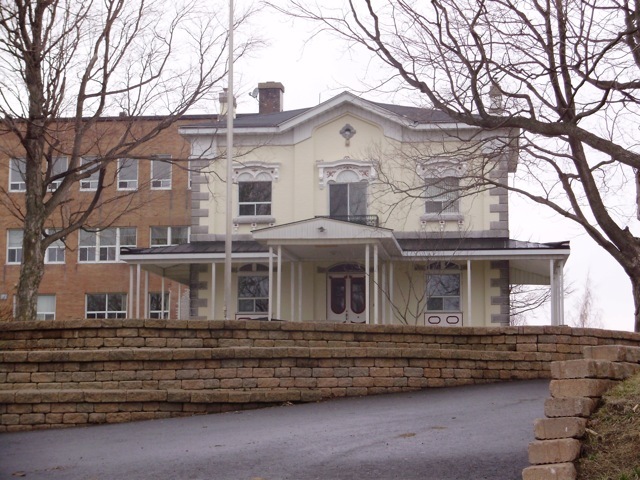 At the time, it was a juniorate (boarding school) for the Brothers of the Sacred Heart. There were all kinds of stories circulating at the time about the history of the building, particularly that a treasure was hidden somewhere. Most were, of course, simply legends, but a body was found on the premises in 1947. I don't know what became of that. There was a little octagonal dome on the building at the time, and I remember climbing up there in the summer for a beautiful view of the river. As an aside, in the window above the door, the letters JAC are interlaced. They are of course Cameron's initials. But the motto of the Brothers of the Sacred Heart is "Ametur Cor Jesu" (may the heart of Jesus be loved). Some saw the coincidence as religiously significant. I have done a lot of research for family history and have had the story of Cameron told to me by a witness who was at the graveyard when the casket was opened. She was a child then and has now passed. However the point I want to make is that in all research nowhere that I found was a daughter mentioned. My name is Hannah Cameron I am related to John. My grandma tells me stories about him all the time. It's nice to read an actual story about him. I would love to visit his home that is still standing and to visit his grave that is not far from where I live as I live in Cornwall. Cool! I just finished reading Pierre Burton's "The Wild Frontier" which tells the story of Cariboo Cameron. Unreal.